Managing PPC campaigns just for desktop can be a handful in and of itself. But throw into the mix managing separate mobile and tablet campaigns, and it can get even trickier. Mobile and tablet targeted campaigns can have different traffic, CPC’s and conversion rates – and you want to know exactly how you can get the most out of each, right? Well I’m here to tell you it ain’t that hard and that you can start managing your fledgling mobile and tablet campaigns like a pro in no time. Judging from the facts above, I gather two important things: 1. Ummm people are using their smartphones, so let’s get with it advertisers! And, 2. Get a mobile page. Please. So now that you know you need to get with the program, how do you begin? Well, if you’ve already started your campaigns and just set it to target “All Devices”. then you’ll be able to segment your data and see for yourself how it’s been going having all devices lumped together. If you haven’t started, then just sit tight. Click into either Ad Groups, Ads or Keywords. Click the “Segment” tab and choose “Device”. Choose an appropriate date range that would give you a statistically significant amount of data. See for yourself how much mobile and table was eating your budget unchecked. Notice in the red box that mobile spend was at $917.25, nearly 25% of the total spend in that ad group in particular. Tablet spend was another $471.05, or about 12% of the total spend. Together, mobile and table used 37% of the budget with no conversions. Conversely, in the blue box, you see that there was a conversion from a tablet and it only spent $80.82. It was incrementally less than the Cost per Conversion of the Desktop segment, which was about $81.14), but notice something? The CTR was significantly better than Desktop (0.37% vs. 0.09%). You might also notice that the Average CPC is slightly less for both mobile and tablet. Do you want to give mobile a legitimate shot with it’s own campaign and budget? Is the Conversion Rate for mobile worth working at with your budget? Do you have a landing page ready for mobile users? Is your product something than can be purchased on a mobile device? The same questions can be asked of your tablet data. What you want to do next is create campaigns targeting each device. Some people choose to only segment out mobile into their own campaigns and leave tablet and desktop together. Now there are some pros and cons to this course of action. Many users use tablets as a desktop or laptop computer and surf the internet the same way. Website displays on the tablet screen are the same for that of a laptop (though this is general assumption since tablet screen size varies). Type of product doesn’t merit the split out. User behavior can be different for tablet vs. desktop or laptop. Tablet users may be searching more in the early evening or night time. Tablet keyboard capabilities limit the search queries. You might get less detailed search queries from a tablet user than a desktop user. Missing out on optimizing the landing page user experience for table users. Open you account, then click into the “Campaigns” tab. Right click and copy (or Ctl + C) and then paste into the same area. Change the campaign name to reflect that it’s now mobile. Change the targeting settings to Mobile Device Only. Change your old campaign to target Desktop. Make sure you change your ads, especially calls-to-actions, to reflect that they are now targeted for mobile users. If you didn’t have a Call Extension activated, go ahead and do so now on the mobile campaign. 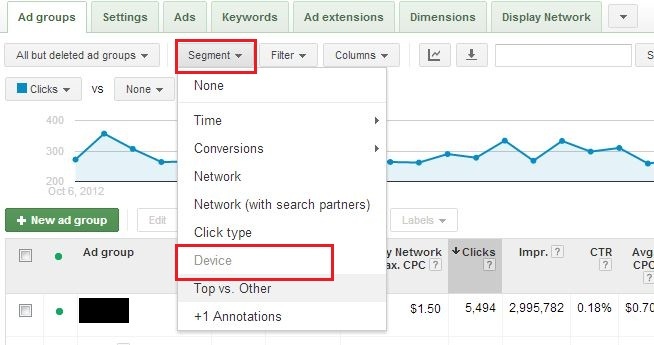 You might discover some interesting things about your device-separated campaigns. Mobile and tablet users might have a different behaviors than desktop and laptop users. What worked for the desktop campaign might no longer work for these devices as far as time and day parting. Make sure you let the campaigns have a good, long leash before you stunt its growth. Give it at least two weeks to find the optimal times that you get the best CTR and Conversion numbers. Just as behaviors might be different for these users, so are their triggers for clicking the ad. Adjust your ads to reflect the new users, their intent, and what action you want them to take. Like I said earlier, you want your landing page to be optimized for this device-specific traffic. Have a mobile ready landing page. Make it easy for mobile users to click around, find out more about your product, and ultimately convert. The keywords that were converting well for your desktop campaigns could very well not work that well in the mobile or tablet campaign. Be prepared to have a different bidding strategy for these campaigns. One that will reflect a typically lower CPC, traffic levels, competition and conversion rates. Mobile and tablet users are already the norm in search traffic and the quicker you adapt, the better your results. Use your data, implement the changes necessary, and see how the numbers will talk to you. Share your own tips and tricks below in the comments!